Another class at Gretchens, this time a wine tasting featuring Spanish value wines brought by Gary Morris from Unique Wine Company. We were volunteer help in the kitchen this time, but we made sure we got to taste everything! Susan, the class coordinator, made up three courses to go with the six featured wines: an antipasto plate with olives, salami, Tuscan white beans with garlic, a piece of toasted baguette, and a parmesan crisp, an oven beef stew (fantastic) with Caesar salad and another parmesan crisp, and gorgonzola cheesecake crusted with pecans and served with crackers and grapes. 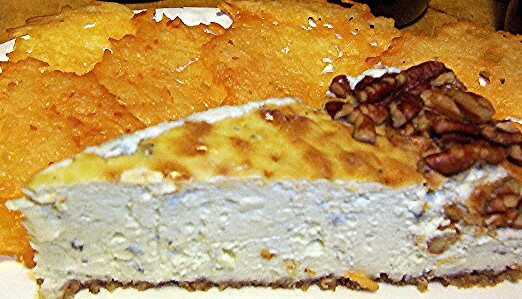 That cheesecake is just spectacular – the picture isn’t great, but believe me, it tastes way better than it looks! Just think of it as a spreadable cheese, not a slice of cake. The wines were all $12 and under and were really drinkable. The first was a Naverán brut cava which I liked a lot – it had more flavor to it than some cavas I’ve tasted. The second wine was a crisp white with a wonderful apple aroma and a very dry finish, Hermanos del Villar 2005 Verdejo “Oro de Castilla.” Lovely. Vinos Sin-Ley 2005 Zestos – bright and fruity, great with antipasto. Bodegas Pau Roses Marola Sinols – very smooth and unchallenging, a good introductory wine for folks who don’t do reds. Señoria de Barahonda 2005 Carro Tinto – our personal favorite, rich but mellow and great with the beef stew. Bodegas Enguera 2005 Dis-Tinto – bright cherry flavor with a little fizz. Fun. 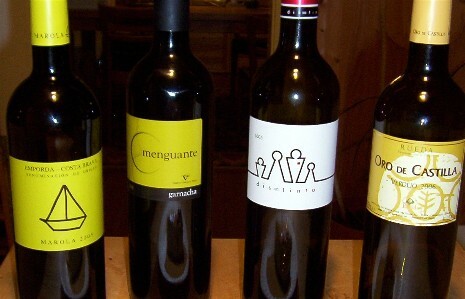 Viñedos y Bodegas Pablo 2005 Menguante Garnacha – nice rich garnacha that tastes like it would go with anything. I love group wine tastings like this, when everyone is relaxed, the food is good and there’s time to really taste each wine. I love visiting tasting rooms, too, but it’s often taking the wine out of context; this way you can actually experience the wine as it would be at a dinner with friends.